One year ago, New Years Day 2010, I was hard at work creating the design, concept and content that would become HMH. Now here we are with our first year complete and in the can; it’s been a remarkably rewarding experience. The work hasn’t slowed but things have certainly gotten smoother. When launching anything, there is always the big question; will it work? The good news is people like what we’re doing (Thank You!) and with the magic of the web, the numbers tell all. For 2010, we published a total of 56 articles in four departments; the majority of them were full length feature pieces. Along with our content, our readership has steadily grown, we will finish out the year with 22,348 total page views from 66 different countries- and this was from a beginning of absolute zero. Our original content is our trademark here at HMH, we do not aggregate. What you see here you will only see here. The same goes for our photographs but the drawback in publishing- even electronic publishing, is always the limits of space. For any one of our feature articles there are hundreds of photos that were shot for that particular piece- some pictures really stand out but for various reasons, didn’t make the final cut. So we’ve compiled a few of our favorites from the past year. This cute little fellow was part of a shoot that never quite happened for an article that didn’t happen- sometimes best intentions and effort aren’t enough. Not every feature concept makes it to publication and in this case, it meant watching travel expenses and work pour down the drain. It was April and we were close to being ready to launch. 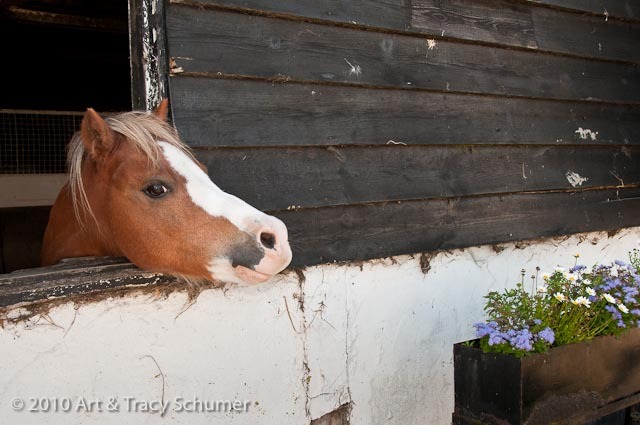 I traveled north to take a road driving course at a Haflinger farm that advertised carriage driving courses. Well it rained, then it rained some more with temperatures at near freezing. It was a tough course, we drove up to four different teams of horses a day, in steep, harsh conditions. Swapping out sloppy, frozen, mud-soaked harness from one team to the next; did I mention the rain? By the end of the week, I’d lost feeling in some of my fingers; thick, stiff leather reins and frozen hands didn’t help. It took weeks for my left hand to fully recover. When the course ended, I found I hadn’t taken a single decent shot for the article. I’d been so miserable and exhausted that when I looked at what I had written it was like reading somebody’s disaster diary. 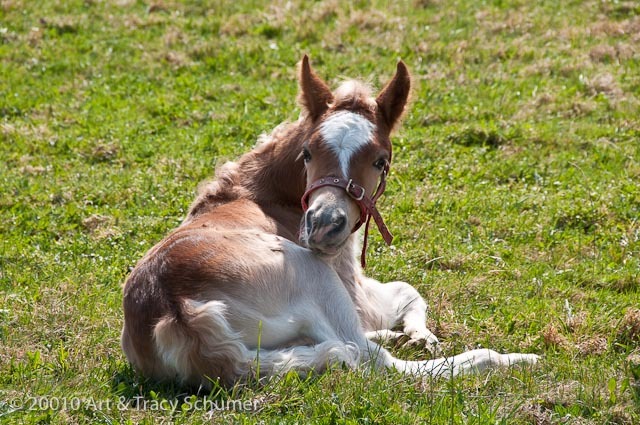 The only nice photo from the week was one I shot the day before the class began, when the farm had their mares out with their new spring foals; the one sunny day of my entire stay. Kids and horses go together like peanut butter and jelly. Whenever I’m on a shoot, I find myself taking a number of photographs that I know will probably never make it into the final article but they’re so cute I can’t help myself. In this case the credit actually goes to my wonderful webmaster husband Art. 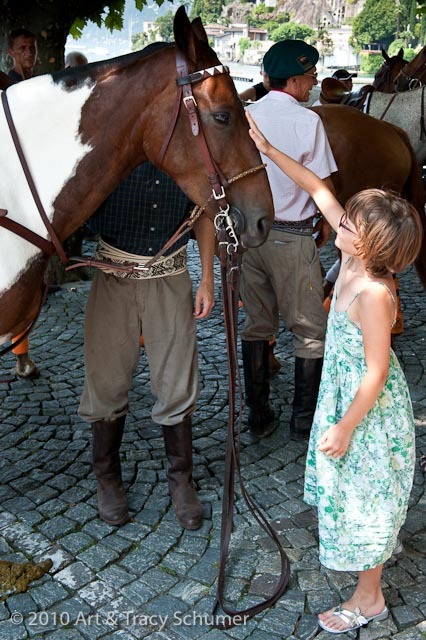 We had just finished photographing the inaugural parade of polo teams down the Ascona water front, it was July, it was hot and the horses were all resting in the shade when Art spotted this little girl making a special connection with one of the ponies. 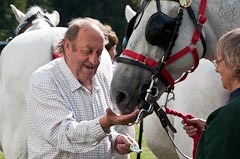 My trip to England this year was a highlight, seeing professional coachman John Parker, a man who has been in the horse business for over sixty years, truly enjoying the company of his horses was inspiring. Horses are four legged fountains of youth, bringing us back to what made us happy when we were children. I took this shot of Parker feeding Polo mints to his horses after an exhibition. He truly loves his horses and they in turn have a deep connection with Parker. At the end of every drive, Parker pets each horse and gives them each some candies. He has the roll of Polos parceled out perfectly so that all four get the same amount. The horses are so accustomed to Parker’s routine that they will refuse to move from the carriage unless they have had their mints! I can’t imagine not loving ponies- especially sweet, precious, tiny ones. At Swingletree in Norfolk, England, stabled alongside the huge coach horses was this little fellow. His name is “Tuby” and he happens to be the smallest driving pony on the farm with a height of 35 inches or a little under one meter. John Parker was standing just out of camera range, getting out a roll of Polo candies (of course) to feed the pony. Tuby was much more excited about the prospect of candy than he was about me taking his picture. My husband Art accompanied me for the week long trip to Portugal. When we arrived at the fair grounds in the little village of Golega, we were so overwhelmed by the sheer numbers of fantastic horses all around us- we both immediately grabbed our cameras and started shooting. The result was an enormous portfolio of pictures to draw from. A good example is the shot that opens this article, a terrific picture but I wasn’t certain this horse was in fact a pure Lusitano so I didn’t use it in the feature. This next photo is another example of why nice shots don’t always make it to print or in this case, to your computer screen. This lovely lady is the daughter of Dr. Felipe Figueriredo who is the director of The Escola Portuguesa d Arte Equestre. 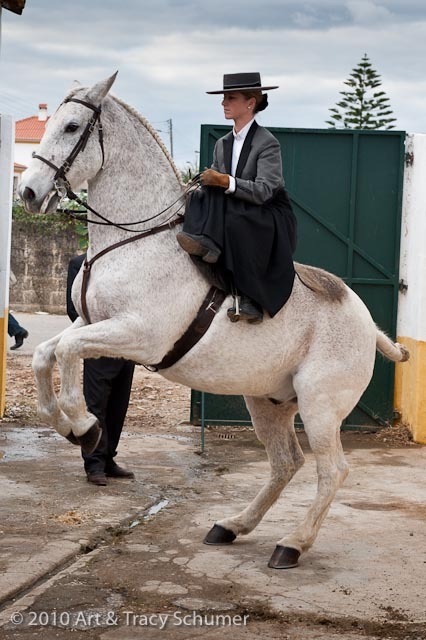 She’s riding side-saddle on a 21 year old Lusitano stallion who is of the classic Baroque body type. Horse and rider are performing one of the most difficult of the high school dressage maneuvers called the Lavade. This maneuver demands great strength and balance from the horse and expert skill from the rider. The horse must rise onto his hind legs, balance his weight and then hold the position for several seconds. 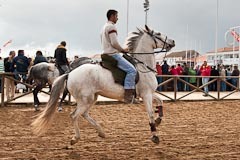 Dr. Figueriredo can be seen just behind the horse, helping to direct the movement. The background of the photo, however, really does not do justice to the beauty of the horse and rider. At the time, I was so pleased to get the shot but in the end we decided to go with the photo of Dr. Figueriredo himself riding inside the house. I still like this photo a lot though as it shows the classically grounded expertise of traditional Portuguese horsemanship. Nicole Giger was my guide on the Portugal trip and I shot this photo of her while we were visiting Casa Cadaval. We had walked out to see a band of two-year-old stud colts in a large pasture. 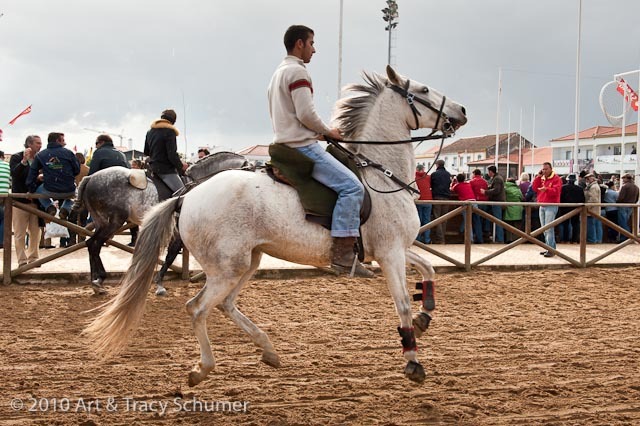 In Portugal, stallions are not treated any differently than mares or geldings. In fact, it’s the stallion that is the preferred riding horse and unless a young colt exhibits significant behavior problems, they will not be gelded. As a result, stallions are well behaved, even when in the company of mares, as I observed numerous times during our stay. Most experienced horsemen would cringe at the sight of a loose stud colt being so close to Nicole’s face but in this case it was fine. 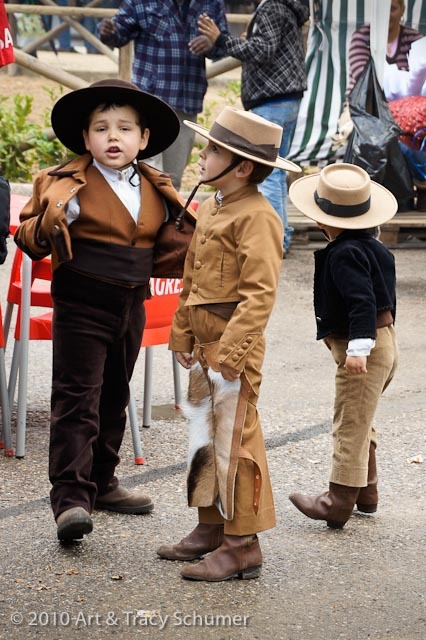 The Lusitano has a remarkable sensitivity towards human company, they seem to be born with it. This band of young colts showed no aggression at all; they simply enjoyed being with us. 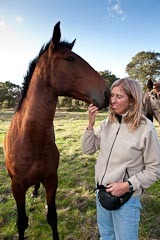 My experience in Portugal has changed my opinion of stallions completely; when they’re treated as normal horses from birth, they behave as normal horses. What I like most about these pictures is that collectively, they illustrate the joy and happiness horses bring to our lives. From all of us here at High Minded Horseman, we would like to wish you a very happy 2011! We love to hear from you, please remember our comment box at the end of each article. Ride safe and ride often! Comments for "2010 Round-Up and Favorite Photos"
Denise on January 09, 2011 Golly, side saddle Levade. Can it be any better?